Where aggies and ivy frame a 526sqm allotment, rolling a lot of 2019 into its dainty cottage parcel. Outwardly it's brush-fenced and secluded perfection. Inwardly, its Insta-worthy updates pair seamlessly with the warmth and whimsy of long ago giving you plenty to write home about. Think stone walls and sash windows, high ceilings and timber floors; a combined living and dining zone opener is cosied by a combustion stove as the urbanised central kitchen greets today with a Smeg dishwasher, gas cooker, electric oven and timber benchtops. The flush-with-lifestyle back end meets a study/sitting room deserving a book, a laptop and you as its window seat fixture overlook's the sun deck. A deck where you can follow the sun, wine and platters in hand. And no one will need a push outdoors when the open plan living end's twin French doors part ways; the alfresco, armed to bear the brunt of Mount Barker's brisk nights, becomes fully enclosable thanks to zip track blinds keeping everyone comfy and coming back. Or let them stay; claim the front master bedroom with wall-to-wall robes as yours leaving a second bedroom to retreat off the lounge room's throw and recliner territory, and a third to tiptoe off the kitchen. As on-trend intervention finds the fully-tiled and powder-white bathroom, rustic charm remains via the block's garden shed, chook pen and cubby house. In a location spoilt with amenity choice and character, walk to the town's heart for cafes, the cinema, or seek out Mount Barker's acclaimed local schools and colleges. *Whilst every endeavour has been made to verify the correct details in this marketing neither the agent, vendor or contracted illustrator take any responsibility for any omission, wrongful inclusion, misdescription or typographical error in this marketing material. Accordingly, all interested parties should make their own enquiries to verify the information provided. 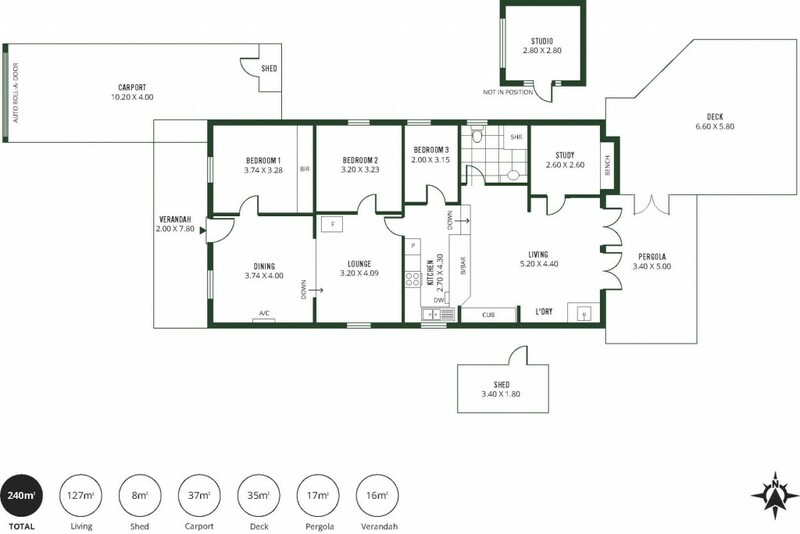 The floor plan included in this marketing material is for illustration purposes only, all measurement are approximate and is intended as an artistic impression only. Any fixtures shown may not necessarily be included in the sale contract and it is essential that any queries are directed to the agent. Any information that is intended to be relied upon should be independently verified.